Do you want to reward your customers, but without giving up your margin? Are you looking to go beyond “strictly business” and build a real relationship? Well, nothing revs up a customer’s imagination than exclusive loyalty programs! It all comes down to behavioural science, really. The idea of receiving something unique, exquisite or reputable is a far stronger motivating factor than simple discounts. I don’t say discounting is evil. But there are many opportunities out there that support your business goals better, especially if you are serving affluent buyers. In this blog post, you can learn why and how exclusive loyalty programs influence customer loyalty. If you like to think about the big picture – and willing to go an extra mile to ensure members have high customer lifetime value – then check out how Recognition Loyalty brings new rules to the loyalty game. Loyalty — an emotional word, right? More often than not, the way we “feel” about a brand determines how we act in relation to it. After all, anybody would be nostalgic after a surprise VIP night spent in a luxury decked out yurt at Coachella, courtesy of a major hotel chain. Guess where the next hotel booking would be! On the other hand, most of us would certainly feel estranged by a too lengthy wait to redeem one discount, or any other kind of brand rewards that take too long to earn—cited by 53% of customers in a HelloWorld study as their biggest loyalty pain point. Brands which channel extraordinary experiences that touch our five senses can fuel long-lasting emotional loyalty. Tiered and exclusive loyalty programs may take different forms, but they all aim for the same overriding objectives: enhancing brand awareness, reducing customer churn, increasing market share. On an added note, having experiential rewards contributes a lot to the feeling of exclusivity. While you can’t put a dollar value on emotions (they’re priceless—right-on, Mastercard), millennial fashion customers are really good at deriving brand value from the emotional reward. That doesn’t really happen with discount-based rewards – in fact, they are the exact opposite; in time, discounts tend to wear down a brand’s perceived (and actual) worth, while customers begin to expect them. 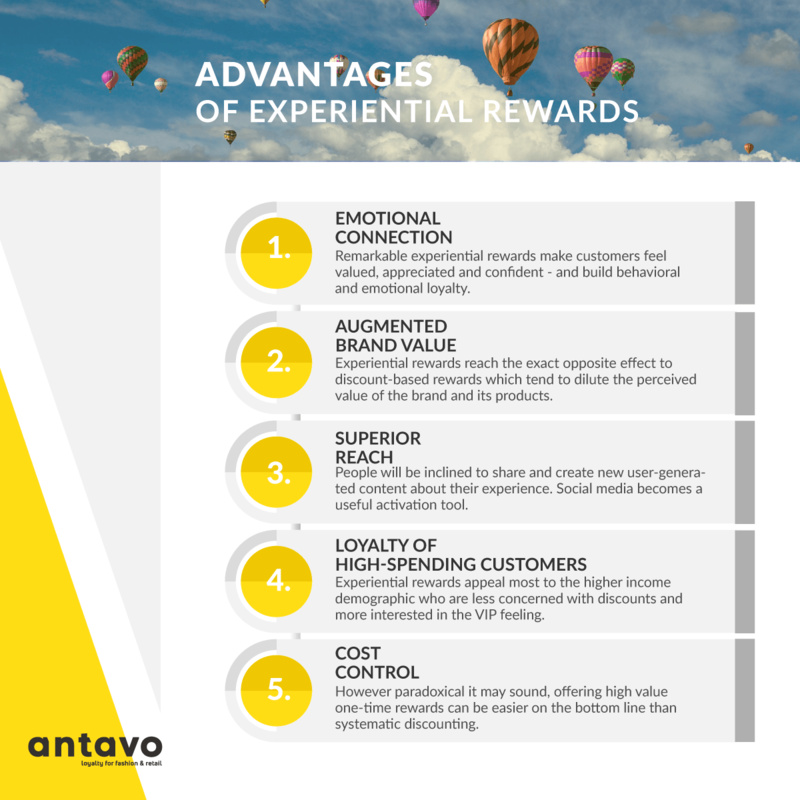 As brands become increasingly aware of this reality, exclusive loyalty programs with experiential rewards are conquering the fashion stage. To build emotion-driven loyalty with your customer base, find below some inspiring examples of rewards with great results. Here at Antavo we find inspiration in the types of rewards our own fashion clients are creating. 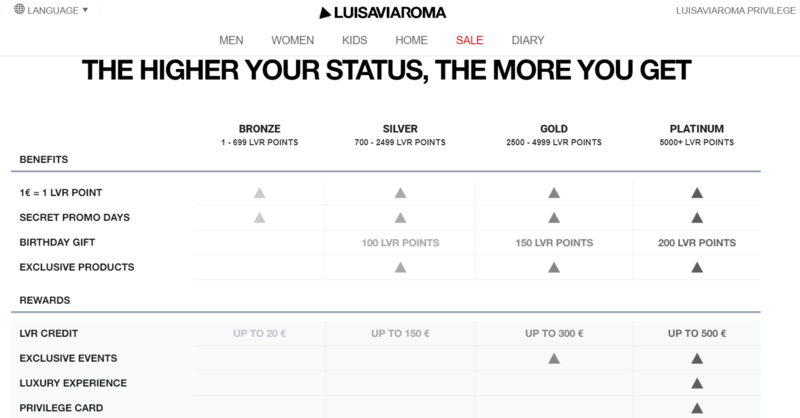 LuisaViaRoma’s strategy combines points and tiers, while reserving the most exclusive experiential rewards for their Platinum level customers. There is another smart strategy that LVR uses. Selected customers with a shared interest can be part of special buying groups, where they can learn about latest limited editions and special offers. For example, the Sneakers Club serves just this purpose. Simply Be is offering a mix of experiential and transactional rewards in their loyalty program, all delivered to their top customers through a surprise-and-delight strategy. Exclusive Experiences That Money Can’t Buy? Yes, Please! A VIP experience should, by definition, be an exquisitely special reward. It’s designed for a selected audience, the privileged few – and makes the perfect mix to convey the feeling of very special treatment. Like, for instance, a high fashion brand taking you to Saville Row, Mayfair, to see how traditional bespoke tailoring works. Understanding which rewards appeal most to your high-valued customers is very important, because whilst a ticket to a summer festival, for instance, may seem like a special and exquisite treat to one person, it can actually be quite dull for the next. People want to feel like they are being offered something really special and not generic. Exclusive loyalty programs should be developed in a way that they hit the sweet spot of the most relevant customer base. The most desired rewards for millennials, according to a survey by The Drum are: travel rewards, SPA days, wellness treatments, event tickets, exclusive shopping nights/weekends for loyal customers. 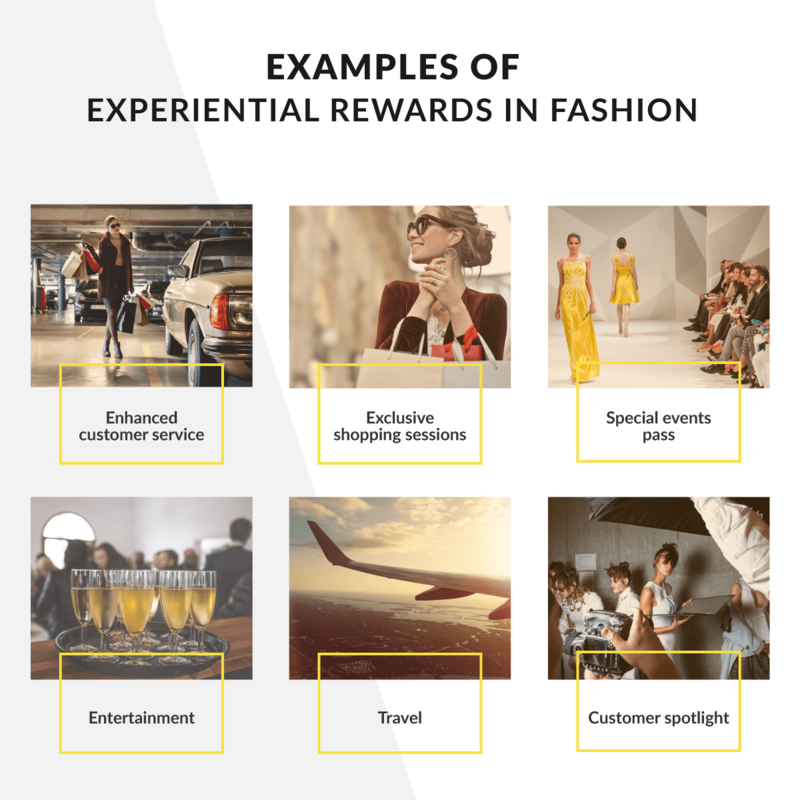 Fashion companies have a wide array of options for specific categories of experiential rewards that rank high in customer satisfaction. Customer spotlight – an invite for VIP customers to participate in brand photoshoots, private trainings and workshops held by the brand. Courses: Learn to put together looks directly from a stylist or make-up artist. Contests: A contest to choose for a free wardrobe update and photoshoot. Give your customers the VIP treatment! Premium rewards are essential for luxury fashion brands that want to curate the customer journey and keep their highest-spending customers loyal through an exclusive loyalty program. Would you like to find the best incentives for your exclusive loyalty program? Book a mentoring session with our loyalty expert; it’ll help you augment your brand value, just like an experiential reward. 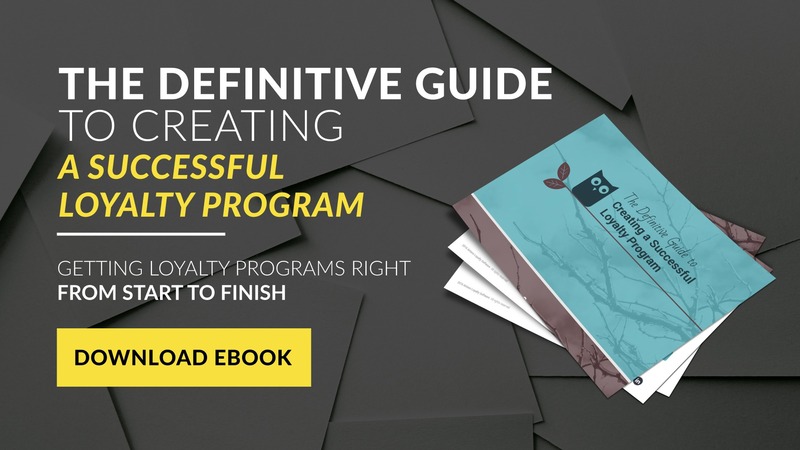 And for more information about building a successful loyalty program, check out our ebook. Stay up to date with the latest customer retention and loyaty tips and news. Zsuzsa is CMO and co-founder of Antavo. She manages the marketing team, talks with experts all over the world, holds webinars, and edits all kinds of content (it’s really a lot of editing, but she loves it). She is a mother, likes working out, and making edible cosmetics.